Oconto County, covering an area of approximately 1,000 square miles, is situated in Northeastern Wisconsin. It is bounded by Marinette and Forest counties on the north, Shawano and Langlade Counties and Menominee Reservation on the West, Brown County on the South and Green Bay on the East. The elongated shape of the County runs on a Northwest-Southeast diagonal approximately 66 miles long. Oconto, the County seat, lies on the shore of Green Bay at the mouth of the Oconto River. The Territory of Wisconsin was established in 1836, and statehood was attained in 1848. On November 4, 1851, the first election was held in what is present day Oconto. Its purpose was the formation and naming of the new County from the northern portion of Brown County. The boundaries were established and the Oconto mill settlement was chosen as the County seat. Thus, Oconto County was brought into being. Oconto was chartered and became a City by an Act of the Legislature of the State of Wisconsin on March 11, 1869. Oconto County takes its name from an early Indian settlement bearing the name of “Oak-a-toe”, meaning rice eaters and is one of the largest counties in Wisconsin, covering over 1,000 square miles. Several museums and many historic sites are located throughout Oconto County. 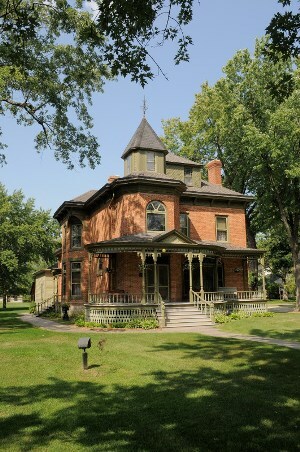 The remarkable Beyer Home & Museum is a fully restored and furnished Victorian mansion . Oconto County is home to one of the last surviving all fieldstone barns in the country, and home to the oldest logging camp in North America. The first know inhabitants of Oconto County are referred to as Copper Culture people, and Copper Culture State Park is located on the burial site of there archaic people. Northern Wisconsin’s four seasons open up a wide variety of activities for all ages. Each year over 100 community festivals and celebrations are held throughout Oconto County, they offer great family fun, and many feature local artisans. Miles of scenic ATV trails in the county, national forests and town roads are open from May 1st to October 31st, with one community known as “ATV Capital of the World”. Oconto County’s 139,000 acres of Nicolet National Forest and 43,000 acres of public county land, offer a wide variety of recreational opportunities and activities. Scenic trails provide an amazing experience for biking, hiking, horse riding, and cross-country skiing. Scenic out-looks provide excellent bird watching vantage points. If your preferred outdoor experience is camping, Oconto County has a campsite to suit your needs. We offer campgrounds with many amenities and rustic National Forest campsites, many of which are situated on beautiful lake shore-lines. Or spend the day in one of our many parks, enjoying the sand beaches, children’s playgrounds, or fishing with your family. Let us lure you in to fish the numerous in-land lakes and trout streams. Add a Master Walleye tournament on the Bay of Green Bay in summer to top it all off. Oconto County offers a lifestyle where you can take advantage of natures’ abundance. We invite you to visit Oconto County, a place for you!